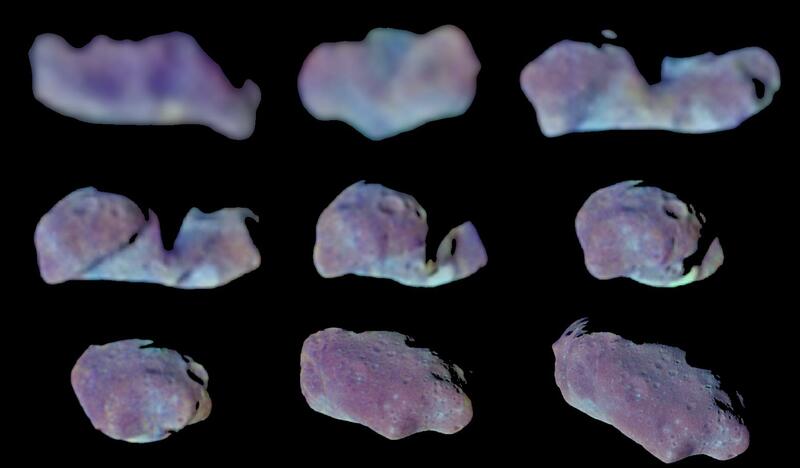 This set of color images of asteroid 243 Ida was taken by the imaging system on the Galileo spacecraft as it approached and raced past the asteroid on August 28, 1993. 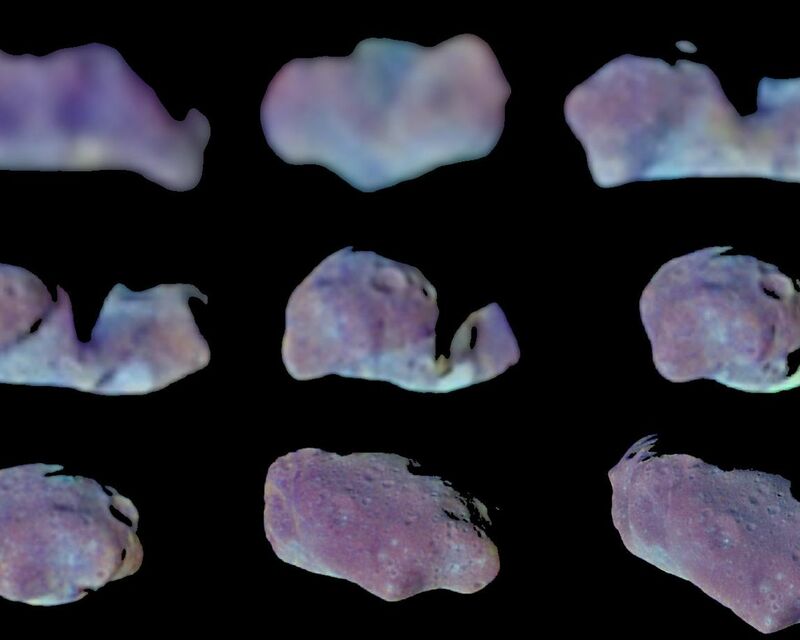 These images were taken through the 4100-angstrom (violet), 7560-angstrom (infrared) and 9680- angstrom (infrared) filters and have been processed to show Ida in exaggerated color to bring out subtle color contrasts caused by small variations in composition and surface microtexture of the asteroid's soil. In natural color Ida appears gray with slight overtones of red or brown. Stark shadows portray Ida's irregular shape, which changes its silhouetted outline when seen from different angles. More subtle shadings reveal surface topography (such as craters) and differences in the physical state and composition of the soil ("regolith"). 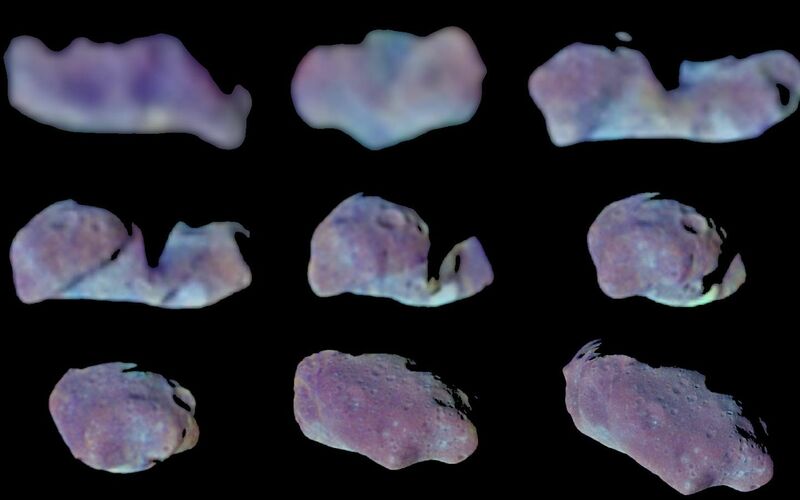 Note in particular the color differences associated with the rims and floors of certain impact craters, which may have excavated to layers of slightly differing composition or may have ingested material from impactors of different compositions. Analysis of the images show that Ida is 58 kilometers long and 23 kilometers wide (36 x 14 miles). Ida is the first asteroid discovered to have a natural satellite, Dactyl (not shown here). Ida and Dactyl are heavily cratered by impacts with smaller asteroids and comets, including some of the same populations of small objects that bombard Earth. 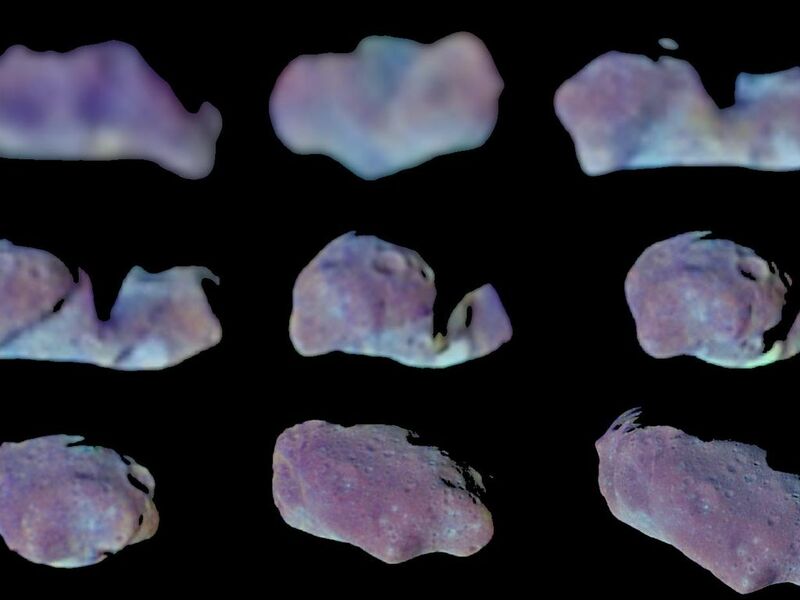 These data, combined with reflectance spectra from Galileo's near-infrared mapping spectrometer, may allow scientists to determine whether Ida is a relatively unaltered primitive object made of material condensed from the primordial Solar Nebula at the origin of the Solar System or whether it has been altered by strong heating--evidence interpreted so far suggests that Ida is a piece of a larger object that has been severely heated. Whereas heating and melting of large planets is well understood, the cause of heating of small asteroids is more enigmatic--it may have involved exotic processes that occurred only for a short time after the birth of the Sun and its planets.